We had a rare break away last week and went to Chester. 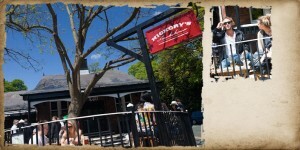 We have a former Smoky Jo’s guest to thank for the recommendation to go to Hickory’s Smokehouse for a meal – and we have our hearty appetites to thank for enabling us to enjoy a veritable feast! The smoked food is of the American variety – not the subtleties of oak smoked salmon but the sort of food that Greg Wallace (Masterchef) would say gives you a wonderful warm kiss in the face, with fabulous flavours and textures! We plumped (and I use the term advisedly) for the Smokehouse Platter: Memphis Style ‘Dry Rubbed’ Baby Back Ribs, Kansas Style ‘BBQ Glazed’ Spare Ribs, Slow Smoked Beef Brisket, BBQ Pulled Pork, fries & slaw. The point of American style smoking and BBQ-ing is S_L_O_W cooking, with rich, deep flavour (and colours) and meat that falls off the bone and melts in your mouth. As Smoky Jo’s food smoking school has developed in our research we have read so much about this sort of food. Pulled pork in particular is something we wanted to taste. It looks shredded and came covered in beans in a BBQ sauce. I balked at beans but I needn’t have done – they were the perfect complement. The smokiest flavour was the sauce that came with the brisket – made with their own smoked bacon – and was absolutely sensational. We had a wonderful meal – having starved our selves since breakfast in preparation. The staff were all friendly and helpful and we met Jason, the boss. He was kind enough to ask his head chef if we could have a look around the kitchen and we did. In spite of the fact that we were about as full as we could be we couldn’t help salivating at all the wonderful smoked meats being prepared for service… in fact just thinking about it and I’m drooling again! It was so good to meet people with a passion for smoked food. Jason and his team are heading for a whistle stop tour to the States next month to pick up some more tips from the guys who win prizes for their rubs, cures, sauces and smoked food. We look forward to hearing how it went. 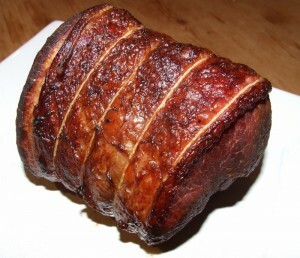 We had a go at some brisket when we got home – doesn’t it look good? I think next time I would unroll it before smoking – we hot-smoked it for about 5 hours… if it had had about four times as long I think it would have been nearly as good as Hickory’s… And if we’d had their sauce… But it was pretty good, all the same!